henryon August 30, 2017 June 6, 2018 Leave a Comment on Introducing Paylater v3— there’s more for everyone. We’ve just released the latest version of our app to the Google Play Store. We’re calling it Paylater v3. It’s been a few months in the making, and we’re excited to finally have it out in the wild. What makes v3 so special? There are 3 major changes for v3, which really set this app apart. By popular demand: larger loans are available to self-employed individuals, students.. everyone! No more Paylater Plus — all Paylater loans, regardless of the amount, now require no documents or wait times, and are available 24/7. We’ve rethought and redesigned the app, making it quicker, more responsive and more fun! Over the last few months, our standard starting loan amount was NGN10,000. 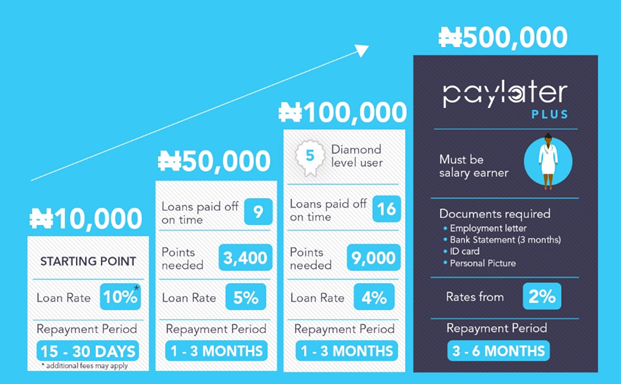 By earning Points in the app through consistent on-time repayments and other positive habits, borrowers gradually climbed up the Paylater Ladder to higher amounts, longer tenures and lower rates. However, as we understood our customers all over the country better, we learnt that NGN10,000 in Benin went a lot further than NGN10,000 in Lagos, for example. So, it didn’t make sense to offer the same thing to different customers with different needs. Additionally, while it quickly became evident that points were an effective means to incentivize positive borrower behaviour — for example, repaying loans on time, and referring trusted friends to the service — having each applicant follow the same credit journey ignored the individual differences stated above. In v3, Paylater loans are now customized to each individual. When you register, our system intelligently determines a loan offer most suitable for you, and you can access that immediately, whether it’s your 1st or 10th loan on our platform. Which brings us to the next big change…. Paylater Plus is dead. Long live Paylater! Paylater Plus was a loan package we introduced with Paylater v2 in November 2016 to cater to some of our customers in formal salaried employment who wanted higher loan amounts, and didn’t mind waiting a little longer to receive funds. While helpful, this created a few problems for our customers that we we were keen to solve. 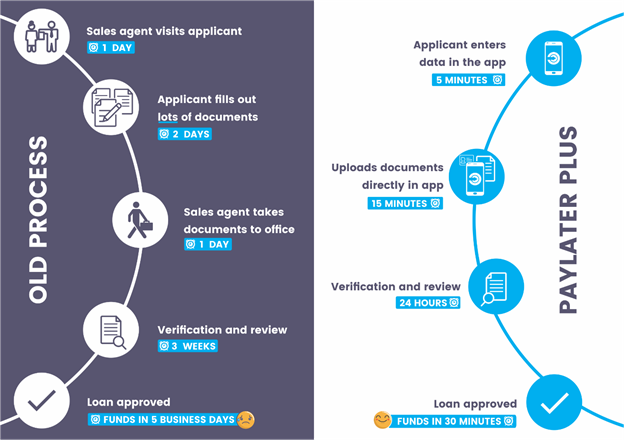 Problem 1: Paylater Plus required supporting documents and a manual underwriting/review process (done only during normal business hours), which was slightly at odds with what we set out to do with Paylater— provide an instant, 24/7 service that funds your account within minutes, regardless of the loan amount being sought, or the time of day. Problem 2: It was only available to salary earners in formal employment. While such individuals tend to have more stable inflows via monthly income, it cut out a significant chunk of our customer base who were working very hard for themselves, and despite having less predictable cash flows, are often equally (or more) equipped to service credit than the ‘9–5’ers. It was obvious we needed to fix this. The eggheads on our data science team came up with a few clever ways (us mere mortals just call it juju) to reliably determine each customer’s affordability, irrespective of employment status, which means that Paylater Plus — in its initial iteration — became redundant. In the new app, we’ve merged it with the existing Paylater package, and so now, whether you’re a student, employee or business owner, you’ll get a loan offer best suited to your personal needs. We no longer require any documents for any of our loans. Verification and every part of the application process will now be completed without paperwork, and within minutes — 24 hours a day, 7 days a week. We’ve rolled Paylater Plus into Paylater, as one cohesive product. No more documents required. No more wait times. Loan decisions within minutes. Available to everyone, anywhere, at any time. For lovers of new and shiny things, you aren’t left out! With the first few versions of the app, most of our time was spent figuring out how to get customers from registration to funds in bank account as quickly as possible, and perhaps neglected some of the finer details of an app with a world-class user experience. After an extensive research and user testing process, we’ve redesigned the app — it’s now more intuitive and delightful to use. It’s smoother — loading screens now transition beautifully from one activity to another. The loan application is shorter — we’ve trimmed down the application to make it quicker and easier to complete applications. There are friendly guides that pop up throughout the app to help and encourage you along the way. All our support channels have now been made available in the app — so we’re always reachable at the click of a button. With the new Paylater update, we’ve packed functionality, speed and security into just 10MB. We really believe it’ll move financial services in Africa a few steps forward. It’s our best app yet, and we can’t wait for you to try it out and tell us what you think. Get the new Paylater app. Available for download now on the Google Play Store.